Yuval Noah Harari (Hebrew: יובל נח הררי‎; born 24 February 1976) is an Israeli historian and a tenured professor in the Department of History at the Hebrew University of Jerusalem. He is the author of the international bestsellers Sapiens: A Brief History of Humankind (2014) and Homo Deus: A Brief History of Tomorrow (2015). His writings examine concepts of free will, consciousness and definitions of intelligence. Harari's early publications are concerned with what he describes as the "cognitive revolution" occurring roughly 50,000 years ago, when Homo sapiens supplanted the rival Neanderthals, mastered cognitive linguistics, developed structured societies, and ascended as apex predators, aided by the agricultural revolution and more recently accelerated by scientific methodology and rationale which have allowed humans to approach near mastery over their environment. His recent books are more cautionary, and work through the consequences of a futuristic biotechnological world where sentient biological organisms are surpassed by their own creations; he has said "Homo sapiens as we know them will disappear in a century or so". Harari was born in Kiryat Ata, Israel, in 1976 and grew up in a secular Jewish family with Lebanese and Eastern European roots in Haifa, Israel. Harari first specialized in medieval history and military history in his studies from 1993 to 1998 at the Hebrew University of Jerusalem. He completed his DPhil (doctorate) degree at Jesus College, Oxford, in 2002 under the supervision of Steven J. Gunn. From 2003 to 2005 he pursued postdoctoral studies in history as a Yad HanadivFellow. His book Sapiens: A Brief History of Humankind was published in Hebrew in 2011 and then in English in 2014; it has since been translated into some 30 additional languages. The book surveys the entire length of human history, from the evolution of Homo sapiens in the Stone Age up to the political and technological revolutions of the 21st century. The Hebrew edition became a bestseller in Israel, and generated much interest both in the academic community and among the general public, turning Harari into a celebrity. YouTube video clips of Harari's Hebrew lectures on the history of the world have been viewed by tens of thousands of Israelis. Harari also gives a free online course in English titled A Brief History of Humankind. More than 100,000 people throughout the world have already taken this course. His book Homo Deus: A Brief History of Tomorrow was published in 2016, examining broad possibilities of the future of Homo sapiens. The book's premise outlines that in the future, humanity is likely to make a significant attempt to gain happiness, immortality and God-like powers. The book goes on to openly speculate various ways this ambition might be realised for Homo sapiens in the future based on the past and present. Among several possibilities for the future, Harari develops a term for a new philosophy or mindset described as Dataism. Harari's next book will be called 21 Lessons for the 21st Century and will focus more on present-day concerns. It is due to be published in August 2018. In a 2017 article Harari has argued that through continuing technological progress and advances in the field of artificial intelligence "by 2050 a new class of people might emerge – the useless class. People who are not just unemployed, but unemployable." He put forward the case that dealing with this new social class economically, socially and politically will be a central challenge for humanity in the coming decades. Harari has commented on the plight of animals, particularly domesticated animals since the agricultural revolution, and is a vegan. In a 2015 Guardian article under the title "Industrial farming is one of the worst crimes in history" he called "[t]he fate of industrially farmed animals (...) one of the most pressing ethical questions of our time." 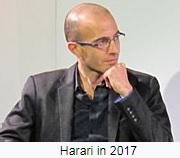 Harari is openly gay, and in 2002 met his husband Itzik Yahav, whom he calls "my internet of all things". Yahav is also Harari's personal manager.They married in a civil ceremony in Toronto in Canada. The couple lives in a moshav (a type of cooperative agricultural community of individual farms) Mesilat Zion near Jerusalem. Harari says Vipassana meditation, which he began whilst in Oxford in 2000, has "transformed my life". He practises for two hours every day (one hour at the start and end of his work day), every year undertakes a meditation retreat of 30 days or longer, in silence and with no books or social media,and is an assistant meditation teacher. He dedicated Homo Deus to "my teacher, S. N. Goenka, who lovingly taught me important things," and said "I could not have written this book without the focus, peace and insight gained from practising Vipassana for fifteen years." He also regards meditation as a way to research. Harari is a vegan, and says this resulted from his research, including his view that the foundation of the dairy industry is the breaking of the bond between mother and calf cows. As of September 2017, he does not have a smartphone. "Why It’s No Longer Possible for Any Country to Win a War", Time (June 23, 2017). Jump up^ Andrew Anthony, Lucy Prebble, Arianna Huffington, Esther Rantzen and a selection of our readers (March 19, 2017). "Yuval Noah Harari: 'Homo sapiens as we know them will disappear in a century or so'". The Observer. ISSN 0029-7712. Retrieved March 17, 2018. ^ Jump up to:a b c Cadwalladr, Carole (5 July 2015). "Yuval Noah Harari: The age of the cyborg has begun – and the consequences cannot be known". The Guardian. Retrieved 2 November 2016. Jump up^ "CV at The Hebrew University of Jerusalem". 2008. Jump up^ Yuval Noah Harari, The Concept of 'Decisive Battles' in World History, in Journal of World History 18:3 (2007), 251–266. Jump up^ Yuval Noah Harari, "Armchairs, Coffee and Authority: Eye-witnesses and Flesh-witnesses Speak about War, 1100–2000", The Journal of Military History74:1 (January 2010), pp. 53–78. Jump up^ Payne, Tom (26 September 2014). "Sapiens: a Brief History of Humankind by Yuval Noah Harari, review: 'urgent questions'". The Telegraph. Retrieved 29 October 2014. Jump up^ Runciman, David (2016-08-24). "Homo Deus by Yuval Noah Harari review – how data will destroy human freedom". The Guardian. ISSN 0261-3077. Retrieved 2017-10-20. Jump up^ Harari, Yuval Noah (2016). Homo Deus: A Brief History of Tomorrow. London: Vintage. p. 75. ISBN 9781784703936. OCLC 953597984. Jump up^ Harari, Yuval Noah (2017). Homo Deus: A Brief History of Tomorrow. London: Vintage. p. 429. ISBN 9781784703936. OCLC 953597984. Jump up^ Harari, Yuval Noah (2016-08-26). "Yuval Noah Harari on big data, Google and the end of free will". Financial Times. Retrieved 2017-10-20. ^ Jump up to:a b Flood, Alison (2017-10-06). "Yuval Noah Harari's new book to cover global warming, God and nationalism". The Guardian. ISSN 0261-3077. Retrieved 2017-10-20. ^ Jump up to:a b "Sapiens author Yuval Noah Harari's third book to look at critical world issues". Hindustan Times. 2017-10-09. Retrieved 2018-02-07. ^ Jump up to:a b c "Fast Talk The Road to Happiness". 25 April 2017 – via Haaretz. Jump up^ Harari, Yuval Noah (2017-05-08). "The meaning of life in a world without work". The Guardian. ISSN 0261-3077. Retrieved 2017-05-10. Jump up^ Harari, Yuval Noah (2015-09-25). "Industrial farming is one of the worst crimes in history". The Guardian. ISSN 0261-3077. Retrieved 2017-04-05. Jump up^ Adams, Tim (27 August 2016). "Yuval Noah Harari: 'We are acquiring powers thought to be divine'". the Guardian. Retrieved 17 March 2018. Jump up^ "Fast Talk / The Road to Happiness". Haaretz. 25 April 2012. Retrieved 17 March 2018. Jump up^ "זה ייגמר בבכי: סוף העולם לפי יובל נח הררי". Retrieved 17 March 2018. Jump up^ Nevatia, Shreevatsa (October 14, 2015). "Sadly, superhumans in the end are not going to be us". Mumbai Mirror. The Times Group. Retrieved 17 March2018. Jump up^ "Fast Talk The Road to Happiness". Haaretz. 25 April 2017. Jump up^ Appleyard, Bryan (31 August 2014). "Asking big questions". thesundaytimes.co.uk. Retrieved 25 July 2015. Jump up^ Reed, John (5 September 2014). "Lunch with the FT: Yuval Noah Harari". ft.com. Retrieved 25 July 2015. Jump up^ "Yuval Harari, author of "Sapiens," on AI, religion, and 60-day meditation retreats". Retrieved 17 March 2018. Jump up^ Adams, Tim (27 August 2016). "Yuval Noah Harari: 'We are quickly acquiring powers that were always thought to be divine'" – via The Guardian. Jump up^ "How Humankind Could Become Totally Useless". Time. Retrieved 17 March 2018. Jump up^ "Interview - Yuval Harari" (PDF). The World Today. Chatham House. October–November 2015. pp. 30–32. Archived (PDF) from the original on December 12, 2017. Retrieved March 17, 2018. Jump up^ "Yuval Noah Harari, Sapiens and the age of the algorithm". The Australian. Josh Glancy. September 3, 2016. Archived from the original on November 10, 2016. Jump up^ "The messenger of inner peace: Satya Narayan Goenka; New Appointments". Vipassana Newsletter 23 (12). Vipassana Research Institute. December 17, 2013. Retrieved 17 March 2018. Jump up^ "Interview With Yuval Noah Harari: Masters in Business (Audio)". Retrieved 17 March 2018. Jump up^ "# 68 -- Reality and the Imagination". Waking Up podcast. Sam Harris. March 19, 2017. Retrieved March 17, 2018. ^ Jump up to:a b "Yuval Harari – YN Harari – Prof. Yuval Noah Harari – Official Site – Sapiens: A Brief History of Humankind". This page was last edited on 4 April 2018, at 20:36.